Lets your amp deliver 60 watts RMS from 20Hz to 20kHz, with all distortions significantly reduced versus the original. With the high stability compensation, pulses settle virtually instantly. This is very noticeable in the presentation of detail. Overall, the mod produces a sense of effortless power, and crystal clarity. Please note: This article is based on my original posting on the Yahoo Eico Forum. The following information represents the changes necessary for proper operation of 6550 tubes in an Eico HF-60 amplifier. These are advanced changes beyond basic (but mandatory) bias circuit changes, mentioned below. While the advanced mods are not complicated, they are extensive enough that I would recommend reading through them to make sure you are comfortable with the work required. Specifically, they address the increased drive required for these tubes, as well as changes to the feedback/stabilization networks to not only maintain, but ultimately improve upon the original Eico performance standards. Some of the modifications will require your own creative effort to implement, but none are very difficult. I leave them up to your own ingenuity to execute. For clarity, all part numbers reference the Sams Photofact schematic for this unit (thumbnail at right). As always, standard warnings apply when working with vacuum tube equipment. (1) Replaced the selenium bias supply rectifier with an appropriate silicon type of your favorite choosing. 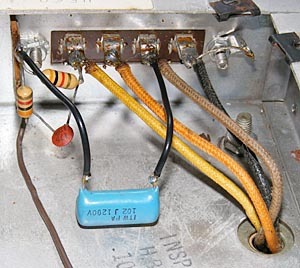 This is most easily accomplished by replacing the original rectifier with an insulated two post terminal strip, oriented to mimic the terminals on the original selenium unit. Connect the transformer lead to the rear terminal, and the resistor and capacitor lead to the front terminal; no solder on either yet. Finally connect a 1A 600 PIV silicon diode between the two new terminals, with the band end of the diode connected to the transformer lead. Polarity is important here! Installing the diode backwards can result in major damage! Solder the terminal with the transformer lead connection, but not the other terminal until later on. (2) Modified the bias supply dropping network to allow for proper bias adjustment of 6550 tubes. When done properly, this should provide a range that will allow your particular tubes to idle at 70 mA each, which produces a voltage of 0.70 vdc at each test jack. An easy way to do this is to change R26 to 11K. (3) Added screen stopper resistors. You can do that by wiring a 100 ohm 1-watt resistor in series with Pin-4 of each output tube. 1. A 1000 ohm grid #1 suppressor resistor needs to be added to each output tube socket. To do this, remove all wiring from pins #5 and #6 of both sockets (including R16 and R19 located there), and add these new resistors between these two pins. Pin #5 of each socket can be soldered, but not pin #6 yet. The leads of these resistors should be as short as practical. 2. Remove the old coupling caps C9 and C10, and remove the old driver plate resistors R11 and R12. 3. Install new grid return resistors of 47k each for R16 and R19, which should preferably be matched. These should now be installed in place of the original wires that connected pin #6 of each output tube socket to it’s respective outside terminal of the Balance Adjustment control. No soldering for either end of these resistors yet. 4. A 10 mfd electrolytic cap of at least 75vdc needs to be added from each side of the Balance Adjustment control to ground (use unused output tube socket ground lugs). Watch polarity! The + end of these caps should go to ground! Solder both connections of these caps. 5. Install new coupling caps of 0.47 mfd at 600vdc each for C9 and C10, which should also be matched if possible. For the front output tube socket (V3), this cap should now connect to pin #6. Solder the side of these caps going to the output tubes. Finally, connect the end of the wire originally going to pin #5 of the rear output tube socket (V4) to pin #6, and solder. The photo below shows V3 in the lower left and driver V2, upper right. Note that the pot seen in the background (and the pic above) is for an unrelated (AC Balance) mod, not discussed here. Without that mod, R11/12 would go to C2A (upper left), instead of the pot. By the way, The unit seen here was really just a test bed to develop the design. Therefore, it hardly displays my best work, as it was never intended to be put on display. Something I would build for long term use would not have mid air connections in it. 6. Replace C11 with a 360 pf 500vdc silver mica cap. Solder both leads. This completes the modifications to the output stage, and all terminals on V3, V4, and the Balance Adjustment control should now be soldered. 7. Replace driver plate resistor R11 (originally connected to pin #5 of V2) with a 47K 2 watt resistor. Replace driver plate resistor R12 (originally connected to pin #2 of V2) with a 56K 2 watt resistor. Both leads of these two resistors should be soldered. 8. A new negative voltage source needs to be created to help power the new driver stage. To do this, connect one end of a 4.7K resistor to the output of the new silicon bias diode. This point is the remaining unsoldered connection on the new two post terminal strip installed earlier. Solder the connection. Connect the other end to a new insulated terminal point anywhere this can be conveniently provided. (The -78V terminal is seen at the very bottom of the photo above, with orange and red wires on it.) From this terminal point (which will become a new -78vdc voltage source), connect a 50 mfd 150 vdc electrolytic cap to ground. Use any convenient ground and solder the connection, but watch polarity! The + end of this cap should be connected to ground! Do not solder the new terminal point with the resistor and cap negative lead connected to it just yet. 9. Replace the driver cathode resistor R13 with a 22K 2 watt resistor, but in doing so, connect one end to pin #3 of V2 (no solder), but do not connect the other end to ground (as the original was), but to the new -78 volt source. A terminal will need to be provided to make this connection to the new source. When done, solder the new terminal for the new cathode resistor, and the new terminal at the new -78 volt source. 10. Add a 1A 600 PIV silicon diode (as seen above) from pin #3 of V2 to ground (use the ground lug formerly used by the old R13), and solder both connections. The diode should be installed so that the band end is connected to pin #3 of V2. This completes the modifications to the driver stage, and all connections should now be soldered. 11. Replace C12 (at right) with a 1000 pf silver mica or film cap. 12. Replace C7 with a 68 pf silver mica cap. 13. Replace C6 with a 0.1 mfd 400vdc cap (at right). 14. BRIDGE R9 with a 680 ohm resistor. This completes the modifications to the feedback/stabilization networks. 15. Replace R24. Ideally, this resistor should be replaced with a small choke of about 30H, rated at 50 mA, and about 1300 ohms. A unit of this size is small enough to easily mount under the chassis as shown below. Alternatively, if no small choke is available, a 1.3K 1/2 watt resistor can be substituted for R24 and a larger 3H 300 mA (likely outboard) choke can be added as shown in the schematic. This completes the overall modification to the unit. This project takes some work, but the results are well worth the effort. Power output is now easily 60 watts RMS from 20Hz to 20kHz, with all distortions significantly reduced over that of the original design as previously noted. Frequency response is slightly and intentionally reduced to 70kHz +0/-0.5 dB (down from the original spec of 90 or 100kHz ± 0.5 dB depending on which design you had), but in return, low and high frequency stability is now rock solid: Pulse conditions settle virtually instantly, while no value of capacitance across the unloaded 16 ohm secondary causes any tendency towards oscillation. The original design would fail this test miserably. With the new design, the effect of the improved stability is very noticeable in the presentation of detail. Overall, the modification produces a sense of effortless power, and great clarity. All of this is achieved now with slightly less negative feedback (20 dB; down from 21 dB), while overall unit sensitivity remains the same. Finally, 10 kHz square wave presentations are outstanding with minimal overshoot and a flat top. There are other modifications that can be made to this unit to enhance performance even further, but some of them start to get outside of the original design topology, and at some point, cease making the unit an HF-60 at all. Others are more simple in execution. The modifications here keep the topology in tact, as well as the original design intent of the unit, while achieving improved performance over the original design from the new 6550 output stage. I hope that for any who try this conversion, you find it as worthwhile as I have. I will be happy to help any who want to replicate it. All I ask is that if you do, you give proper credit where credit is due. There is concern (from previous experience) that the Sams schematic of the HF-60 might have errors. Comments? (a) R8 was originally 2.2K. (b) R7 was originally 400K. (c) C7 was originally 68pf. (d) R6 was originally 15K. (e) R6 was originally bypassed by a 47pf. (f) R11 was originally 27K. This is also what Sams shows, but was rather quickly changed to 28.75K in keeping with all of Eico’s other units. (g) Pin #5 of V3 has a 25pf connected between it and ground. (h) C11 was originally 470pf. (i) R15 originally did not exist. 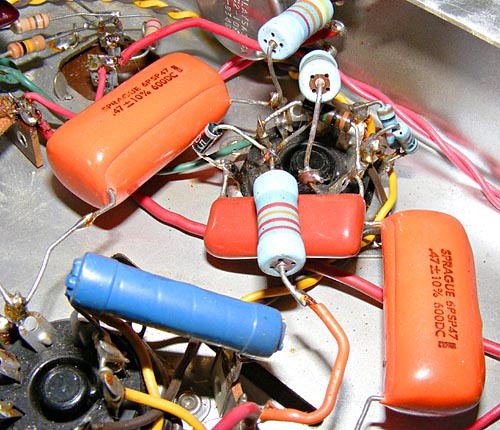 B+ for preamp power was originally supplied directly from the 420v source as identified on the Sams schematic. (j) Of course, the values listed on the Sams schematic for the Bias Adjust and the Balance Adjust controls are reversed. (A) Instability (motorboating) when powering certain preamplifiers. This was eliminated by the addition of R15 to decouple the preamplifier B+ power. (B) Marginal drive capability from the driver stage to the output stage when powering a preamplifier. This was improved by powering R15 directly from the rectifier tube, rather than taking from the driver B+ supply. (C) Inconsistent gain and linearity in V1. This was corrected with the changes to R7 and R8. (D) While the early version had slightly better high frequency stability, it did so at a notable expense to 20kHz total harmonic distortion (THD). Changes to the remaining parts as listed here offered an improvement to THD, but reduced the high frequency stability as well. Achieving good performance through a proper balance of high frequency stability, response, and THD is as much an art as it is a science in a feedback amplifier, as they are all interrelated with each other. Determining what the best mix is for any given design is as unique as every different blend of coffee. It all depends on what you’re starting with. Eico was clearly retargeting it’s goals here, no doubt with a heavy hand from marketing so it could claim a frequency response to 100kHz for the HF-60. As was all too typical in those days though, it was done so at the expense of stability. In reality, neither version had anywhere near the stability that the 6550 modification provides. While high frequency THD and frequency response are important, high frequency stability is most important, and should never take a back seat to the other two criteria. Of the three areas, it has the greatest impact on the reproduction of musical detail. What is the purpose of adding the 1A silicon diode in your Step-10? An excellent question! This is only a safety device, and is required because of the timing of events at start up. Do not omit it – it is a mandatory part with the new driver stage. First, consider that the new negative supply voltage is available virtually immediately at turn on. Next, consider that while it takes a few seconds for the 6SN7 driver to warm up, the GZ34/5AR4 rectifier takes considerably longer to warm up. It is during this critical period (and only during this period) that the diode performs it’s function. With the negative voltage source immediately available and only the 6SN7 warmed up, without the diode, the 6SN7 would conduct this negative voltage onto the B+ rail and place a negative voltage on the B+ capacitors until the rectifier warms up to counteract it. This is obviously very damaging to those caps, and over time would shorten their life significantly. With the diode in place during this time, the negative voltage source merely draws it’s current through the diode from ground, and prevents any negative voltage from appearing on the B+ rail. Of course during normal operation, the cathode of the new driver stage operates at about 96 vdc, so the diode is then biased into non-conduction, just waiting for the next turn on cycle to protect the caps. I have read elsewhere of the application of a negative voltage through a constant current source (CCS), or other means, to cathodes/common cathode resistor to raise the negative floor. Is your plan similar and what is the principle behind the change? Another great question. With a cathode coupled (long tail) phase inverter, the bigger the value the cathode resistor can be, the more the stage approaches constant current operation. As that happens, the two plate load resistors can approach becoming identical in value, since if they were truly equal, and the stage truly was operating with constant current, then the output at each plate must be equal. Over the years, various approaches have been used to raise the value of the cathode resistor to help achieve a constant current state of operation. CCS devices, discrete circuits, and negative voltage sources have all aided in this effort. (1) EL34s require about 70 vac P-P to develop full power output. 6550s require as much as 115 vac P-P.
(2) EL34s are stable enough with a 180K grid #1 resistor. With this same value however, 6550s are marginally stable at best. (3)The original driver stage was only capable of delivering an absolute maximum of 80 vac P-P under maximum power output conditions. (i.e. when the B+ has sagged), and this, into a 180K grid return resistor in each leg at that. The new driver stage is capable of delivering over 170 vac P-P under full power output conditions, and into a 47K grid return resistor in each leg. (4) The new driver stage has about 65% more gain, which almost perfectly compensates for the loss of gain in the new 6550 output stage, which means the feedback and sensitivity levels remain almost unchanged. With the new driver stage, the raised B+ allows for greater output and greater gain to be had, both of which the 6550 needs, by way of using larger plate load resistors. But doing so without making a corresponding change in the cathode resistor would have made the stage terribly unbalanced. And, if the cathode resistor had been raised according and still connected to ground, the stage could not have conducted the proper amount of current to produce the increased output – it would have been over biased. Using the new negative supply as a return instead, allows the use of a cathode resistor that is appropriate for the new plate load resistors now used, while allowing the stage to conduct all the current it needs to produce the increased output. Looked at another way, the old design operated the tube under static conditions from a 420 volt source. Under the same conditions, the new design operates it from over 550 volts. This combined with the new plate load resistors makes all the difference. While a medium mu triode will produce the best performance here, it will also cause the required input drive level to approach about 4-VAC RMS or so to achieve full power output. This can be a benefit in terms of ultimate noise level, but also requires a preamp capable of delivering that output at low distortion and low impedance, and with an adequate amount of gain for the input sources being used. If this kind of preamp performance is not available, then sticking with the original EF86 input tube might be best. With it, the unit retains most of its stock sensitivity, is almost completely insensitive to preamp output impedance (because the input tube is a pentode), and it can be used with preamps of traditional sensitivity. 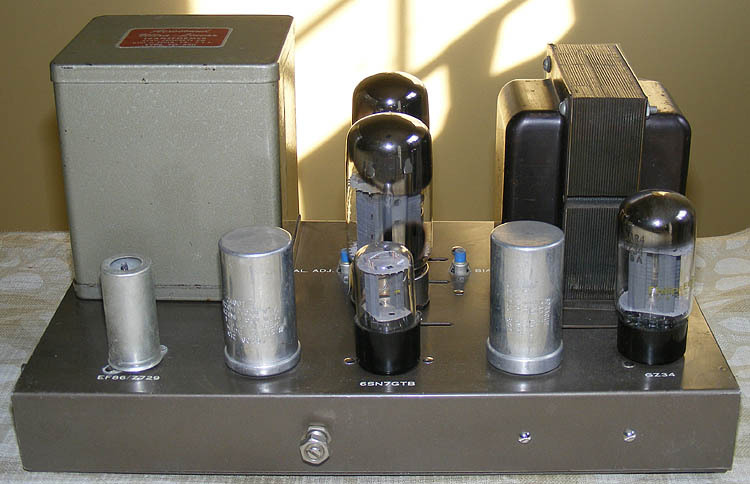 An alternative approach would be to use a high mu triode such as a 12AX7 for the input tube, à la the HF-89 amplifier. This would provide an intermediate level of performance improvement: high frequency distortion would not be quite as good as that which a medium mu triode could obtain (although better than an EF86), and you would again want to use a preamplifier with a reasonably low output impedance. But the input drive level would only require a more sane 1 volt or so to achieve full power, too. How does the 6CG7 help high frequency stability and distortion? The problem with the EF86 pentode in the HF-50/60 amplifiers is because of it’s very high output impedance (when operated in pentode mode) combined with the gain of the diff-amp phase inverter stage following it. This combination allows the Miller Effect to work full force within the inverter stage, which places a greater capacitive load on the high output impedance of the EF86 stage, all of which causes the open loop frequency response of these amplifiers to be rather poor. Using a triode input stage is a definite step in the right direction to help curtail this problem – to the point that using half of a medium mu triode such as a 6CG7 – or even both sections of this tube paralleled (even better) to drive the diff-amp inverter stage can produce excellent open loop response. Since this type of setup produces a very low output impedance into the inverter stage, the Miller Effect in the inverter is minimized, while the capacitive load presented back to the medium mu input stage does little to load it down. Also, since the impedance is so low at this point, this new input stage has little difficulty driving the transitional phase shift network located there, as well. The net result of this is lowered distortion at high frequencies since the transitional network doesn’t produce nearly as broad an impact on the frequency response of a low impedance stage. This allows any feedback to be more effective in the audio range, and produce the lower distortion figures that result. Hi Tyler -- Thanks for your interest in this modification. The Hammond model P-T154E (in stock at Antique Electronic Supply) will fill the bill perfectly. It is rated at 20 Hy at 20 mA, which is still plenty of inductance to properly filter the B+ supply for the phase inverter and AF amplifier stages. The actual inductance displayed by the choke will be higher than its rated value anyway, because the circuit is drawing only half of the current the choke is rated to handle. Also, there seems to be confusion with the 300 volt rating of this choke as indicated by the Antique site. I've used a number of this model choke, and have received it packaged in both a box, and a baggy by Hammond. When boxed, the box echoes the 300 volt rating. When in a plastic bag, a 500 volt rating is indicated. Same choke, different specifications. In actual practice with a number of this model choke used in this application, there have been no known failures to date. Any one know of a source for a suitable choke that will fit under the chassis? Modified schematic calls for 30H @ 50mA to replace R24. The new production chokes I've seen seem to be too large to fit under the chassis. Dave, Thanks for your reply and comments. Your suggestion to use a cathodyne phase inverter with one half of the 6CG7 as a gain stage is a valid and good suggestion. Many very good sounding amplifiers have used this topology. This would have the gain stage operating as a single ended amplifier with its higher even harmonic distortion, which is not necessarily a bad thing as the even harmonics are not perceived as objectionable. But then, all PP amps tend to have low levels of even harmonics with the far more objectionable odd harmonics unattenuated. Hence, the need for a fair amount of feedback to reduce odd harmonic distortion to acceptable levels (as well as to increase the damping factor). One thing I failed to point out in previous replies was that I was intending to long tail the 6CG7 pair as did your mod suggest for the 6SN7. This will result in a balanced/differential stage that will provide equal amplitude output signals from inputs to either grid thus resulting in no need for the attenuated first stage signal being fed to the second half of the 6CG7, resulting in a full differential amplifier throughout. Obviously, the feedback signal can indeed be fed to the second grid. Which topology is better? I doubt that there would be any discernable difference in the perceived sound quality. Either should sound very good. Hi Dan -- Thank-you for your comments! Converting the front end of the HF-60 to a Williamson style front end would be a very good way to go, and in deed would provide more gain. The history of the doubled up 6CG7 gain stage is that the modification originally took life as promoting a change in output tubes, as the 6550 simply works better with the TO-330 than the EL34 family of tubes does. That was the sole aim of the modification. However, after I presented that modification, I had a number of requests to convert the input stage to triode operation, while reducing the excessive input gain of the HF-60 design. I suggest that a conversion could be made, and would actually improve HF distortion performance. Hence, the change to the doubled up triode input stage. That configuration allows for better HF distortion performance, as the output impedance of the stage is much lower than would be obtained by simply converting the original EF86 input stage to triode operation. A low output impedance means that the HF transition network will have less effect down within the audio bandwidth, leaving more of the distortion canceling NFB in place to reduce HF distortion. Also please understand that the effort was to still try and work within the topology of the original HF-60 design, so that an all out gutting as you are suggesting was dismissed from the get-go. If you change phase inverters, I strongly suggest that you either stay with a cathode coupled or phase splitter topology. The paraphase type inverter you describe is notably inferior in terms of maintaining equal response from the output of the inverter stage, both in amplitude as tubes are changed, and in phase response at low frequencies, since the "bottom" drive leg goes through an additional R/C network versus the top leg. If you do convert to such a design, the global NFB loop must still be inserted into the cathode leg of the AF amplifier section of that type of inverter stage. To insert it into the bottom (or second) 6CG7 grid would principally only apply the NFB to the bottom side of the push-pull pair. Dave, I was considering the input phase inverter of the configuration where the first stage output signal is divided down by a factor of the stage gain and fed to the grid of the other tube half to provide the phase inversion. The 6CG7 cathode bypass cap is then eliminated and since you now have equal outputs from each half of the 6CG7 the effective output voltage is doubled giving an equivalent of twice the input stage gain. The unbypassed 6CG7 cathode resistor serves to further balance the first stage output signals. It would be necessary to cap couple into the 6SN7 grids. Since both 6SN7 grids are now receiving equal and opposite signals this results in twice the 6SN7 output voltage which results in a total of four times the gain. Feedback is applied to the second 6CG7 grid. 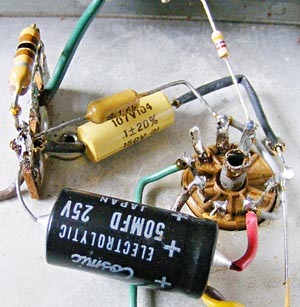 The unbypassed 6SN7 cathode resistor further balances the drive signals to the output tubes, which is now considerably less critical. The drive signals are now self balancing rather than taking a stab at balance by using unequal 6SN7 plate resistors. Seems like a fair bit of improvement to me. Hi Dave, I just came across your post, which is of considerable interest as I have collected most of the parts (of better quality than the original) to build a pair of upgraded HF-60s. If changing the input tube to a 6CG7, or other similar dual low rp triode, then why not go the extra step and configure it as the phase inverter stage with the 6SN7 functioning as the driver stage; this would result in twice the equivalent input stage gain and also twice the 6SN7 gain, keeping the required input voltage at one volt. This would allow the driver stage to use equal value plate resistors, and also somewhat lessen the requirement for a constant current cathode source. Also, wondering whether you made a comparison of EL34 and 6550 with your upgrade mods installed. I have a quad of unused Svetlana Gold top EL34s and some Svetlana 6550s and JJ Kt88s.